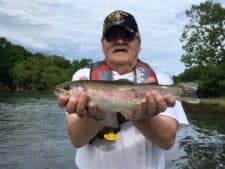 Full line fly fishing shop and expert guide service! « Lots Of Fishing Going On! Absolutely gorgeous day today! Sun is out, very light wind and it is 76 degrees at noon. It might make 80! More nice weather for the rest of the week….70s and 80s. By the weekend, we see some chances for showers. Still seeing lots of trips. Last Saturday, James Albert took Jeff, from Oklahoma, out for half a day. Good day for Jeff on the big ruby with a beadhead Cerise San Juan worm dropper, or stripping the filoflume. Jeff caught his first fish stripping on this trip. Fun! Doug and Dixie spent the morning on the water with Jim. They are fairly new, so Jim spent time working with them on skills. They caught their fish on the pink San Juan worm and stripping the tiger tail. Dana had Martin on the water. He was catching on the holographic green crackleback, lightning bug and orange egg pattern. Not only did he catch trout, but he also caught a couple blue gills! Gary and Jerry spent the day on the water with Stan. Good day for these guys on the big ruby with a lightning bug dropper or stripping the crackleback. Sunday, Jeff and Brett fished late in the morning with Stan. We had some unexpected rain show up that morning, so they waited until around noon before going out. First time fly fishers, but they both brought in fish on the Big ruby with a ruby 2 dropper. and stripping the crackleback. These two were here fore the Vietnam Vet reunion. Thank you guys!! Jim and Stan had a group of guys, one of whom we know was from Pennsylvania on the water. Rick and Jason were with Jim. Jay and his son, Gus were with Stan. Really good day for all of them on the tiger tail, cerise San Juan worm, big ruby, lightning bug and crackleback. Jay and Gus became new strippers. Really liked it. Wednesday, Gina and Bill fish with Carolyn again. Gina had just retired and was enjoying it. Good day on the cerise San Juan worm under the big ruby and stripping the tiger tail. especially for new guys, on the big ruby and beaded cerise San Juan. 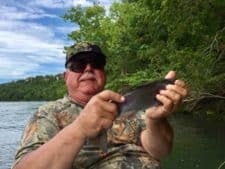 This entry was posted on Saturday, June 24th, 2017 at 12:43 pm	and is filed under Fishing Reports. You can follow any responses to this entry through the RSS 2.0 feed. You can leave a response, or trackback from your own site. 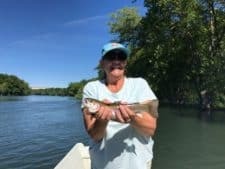 Branson Trout Fishing at River Run Outfitters is proudly powered by WordPress!